Ready Player One by Ernie Cline // I picked up this read per the Modern Mrs. Darcy Summer Reading Guide page turners. I really was sucked in to the virtual world of the OASIS that Cline created despite the overwhelming videogame geek nostalgia and the Reddit bro beta male protagonist that would generally turn me off. Within the first twenty pages, we’re subjected to a rant by the main character, Wade, about the lies he had been told, like “God the sky fairy” and a whole lot of adolescent opinions at which the reader is supposed to nod knowingly in solidarity. But I’m glad I kept reading. The puzzle plot was intriguing and made me binge read the whole thing. I stole minutes of reading in between packing boxes in order to get to the end. Incidentally, I can tell I needed a deeper book to read because I kept thinking about how the book revealed culture’s confused mind/body dualism. Wade, the main character, meets one of his online friends IRL and discovers his friend isn’t who he thought this person would be. “As we continued to talk, going through the motions of getting to know each other,” he explains, “I realized we already did know each other, as well as any two people could. We’d known each other for years, in the most intimate way possible. We connected on a purely mental level. […] None of that had changed, or could be changed by anything as inconsequential as her gender, or skin color, or sexual orientation.” [Emphasis mine.] You’ve heard this before. Nothing physical about a person is essential to who they are. But the book’s anti-material Gnosticism coexists with the main character’s realization that virtual reality isn’t as great as living in the real world outside the OASIS. It’s indicative of a general confusion about bodies, souls, and intimacy if these contradictions creep into even this simple pleasure read about eighties nostalgia and D&D adventures. All the way from London, he had been violently confused by her real presence in the opposite inaccessible corner. For months he had been possessed by the imagination of her. […] Her presence had been unimaginable, or more strictly, onlyto be imagined. Yet here she was, and he was engaged in observing the ways in which she resembled, or differed from, the woman he dreamed, or reached for in sleep, or would fight for. 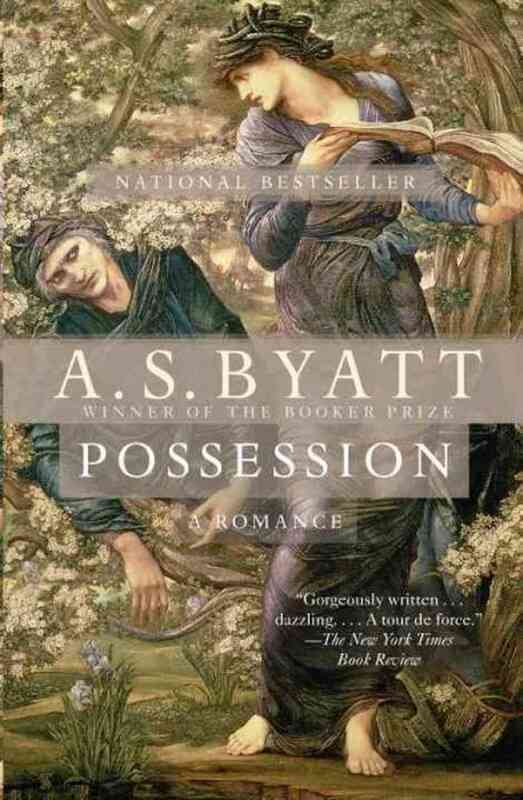 I also enjoyed Byatt’s implicit criticism or mocking of feminist literary theory. It acts as a corrective to reducing all feeling to mere bodily instinct and desire. Roland reads a feminist explication of one of LaMotte’s poems and comments to Maud about how, if “everything is human sexuality,” then “Everything relates to us and so we’re imprisoned in ourselves – we can’t see things.” Like LaMotte says to a young cousin in the book, we have to see ourselves as both Martha and Mary, body and soul. I could write many more words about this book and I’m not even finished yet. Read it. It’s good. Feelin’ like a Sassanech around here. 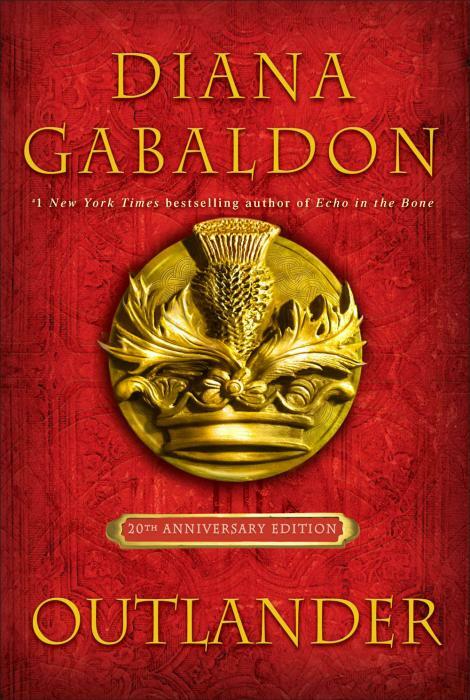 On the other end of the spectrum, I’m simultaneously reading Outlander and someone needs to explain the hype to me. I am over halfway through and I am not finding it compelling. Is it the mystery of how Claire is sent back in time that’s intriguing? The 50 Shades of Plaid factor? Why would I spend another gazillion pages with these characters? I want to finish the first one just to find out what the hook is. Aaaaand, I’m also sloooowly reading From Field to Fork: Food Ethics for Everyone, a new release from Oxford University Press. The author, Paul Thompson, is a philosophy professor, so it’s interesting to read his perspective on food since most of my exposure to food ethics has been through aesthetic arguments like Wendell Berry’s writing or shock journalism (Food Inc.). I’ve been pretty underwhelmed and I’m reminded how extraordinarily unimpressive rights theory is to me since the book is almost all casuistry. Team Virtue Ethics, yo. I also read Astonish Me by Maggie Shipstead on our road trip back from DC per the Modern Mrs Darcy Summer Reading Guide page turner recommendations. It was…fine. A page turner about ballerinas with a silly twist to boot. Absolutely mindless. I picked another one from the same list next, The Accident, but thought the premise ridiculous – a manuscript So Dangerous, even the CIA is involved!!! – and I found myself 50% through and nothing had really happened yet in the plot, so I abandoned that sucker. What are you reading? Did you like Outlander and what is wrong with me? I love new Goodreads friends! 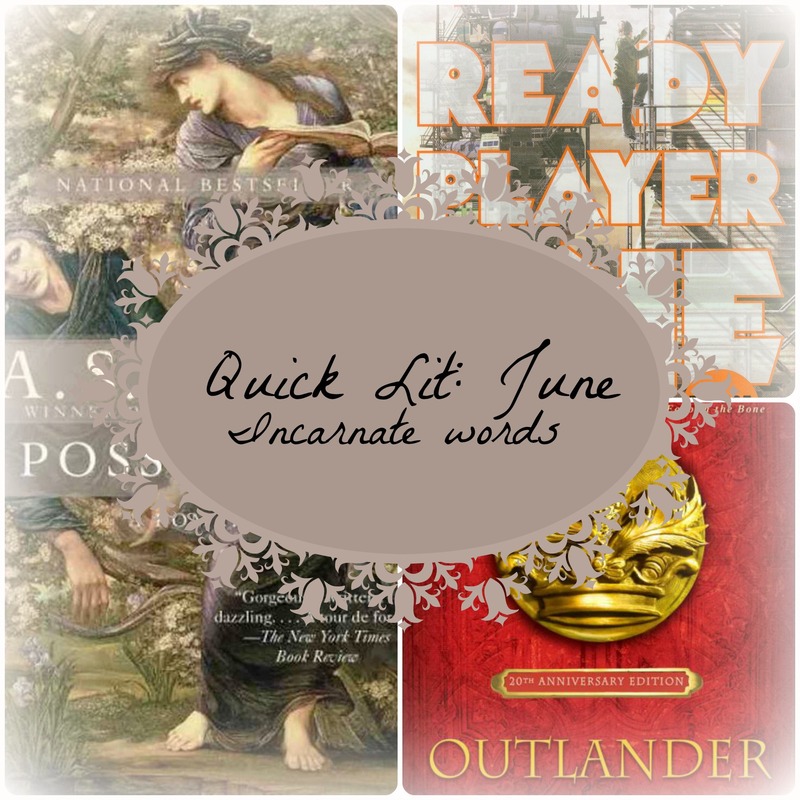 Linking up with Quick Lit over at Modern Mrs. Darcy! Thanks for stopping by! I wanted something fun and mindless with Outlander, but it’s turning out to just be mindless drudgery. 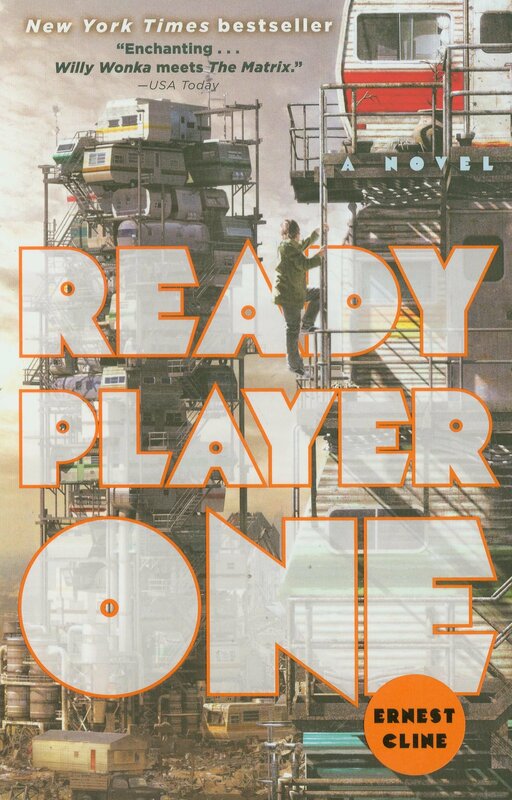 Ready Player One was definitely a fun and mindless read and I’d recommend both that and Possession to you! Hahaha 50 Shades of Plaid. That’s great. I listened to Outlander, while I kept waiting for it to get good. It was embarrassing to listen to, even by myself. I thought that Astonish Me was an good read. I listened to The Goldfinch at double speed on audio and it took FOREVER. I can’t imagine reading it. hahaha, embarrassing to listen to, even by yourself. That’s how I felt marking it as Currently Reading on Goodreads. So ashamed. And it turns out, it wasn’t even worth it! It’s not even a fun bubblegum read! Sigh. And The Goldfinch did, indeed, take forever, and I was switching off between reading and listening to the audiobook. I should have listened on double speed. That’s a great idea. Great reviews. I am also chuckling at “50 Shades of Plaid”! I read the first one, and continued to the second one in hopes that I would finally get what all the fuss was about–but I ended up skimming a few hundred pages (! )before abandoning it for good. I also enjoyed Ready Player One very much. I read Astonish Me last summer and was underwhelmed, too. And I had The Accident on my radar, but I think based on your review I’ll pass. I read The Expats by Chris Pavone, and it was okay. 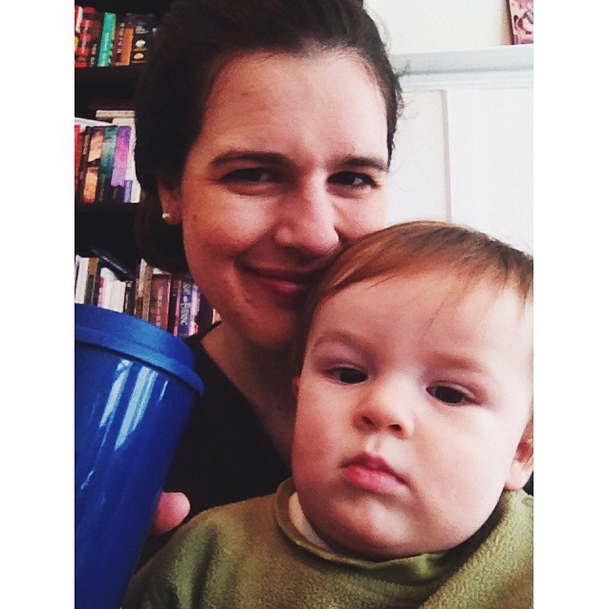 I had a question for you–total shot in the dark, but I saw in your profile that you majored in Russian history. Have you read War and Peace? I have just set it aside after 40 pages of trying to keep names straight. 40 pages–lame, I know–that’s like 1%. Anyway, I wondered what your thoughts are. To my shame, I haven’t read War and Peace or much Tolstoy at all. I really should tackle Anna Karenina at least. I took a Dostoevsky class in college and LOVED it, but his books are very theological and I always found Tolstoy’s self-made proto-John Lennon schtick to be tiresome so I didn’t give his books a shot. Which is a crime. Maybe I’ll make that a goal for the winter!